In most privately owned family businesses, the chairman of the board is a family member. But for some family ownership groups, an executive from outside the family is the best choice for the chairman's job. 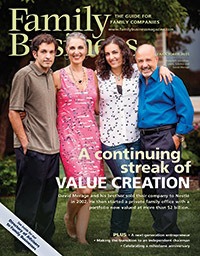 Several multigenerational families, for example, have found that a non-family chairman can best manage the boundaries between the family and the business, while meeting the needs of both. Long-term planning can be a challenge for any company, but family businesses have their own unique set of obstacles when it comes to making plans for the future. A long-term business plan is both worth the work and critical to continued success. The planning process provides an opportunity for family businesses to become more intentional and principle-driven. One of the challenges unique to privately owned family businesses is that the longer they're around, the bigger the family gets. And in many cases, as the family grows, so does the number of shareholders. Family businesses often pass ownership on to family members, of course, which means that by the third generation there can be a virtual sea of family shareholders. In order to satisfy the needs of everyone in the expanded ownership group, the business must grow and continue to be profitable. What should your business be doing differently? How might technology change in the next five years, and how would those changes affect you? What might happen in your markets that would invalidate your business plan? Who will be your next wave of competitors? Should you diversify your holdings? Have you considered all potential growth opportunities? Do you have the right personnel to manage these changes? When is the last time your leadership team sat down and considered these questions? Anyone in a multigenerational family business has profound responsibilities centering on the concepts of "birthright" and "duty." Let's break it down. I define "birthright" as an individual's right to identify and assume his or her own values. Our actions are based on our values—what we believe is important. Through our actions we share our personal legacy, whether we are conscious of that or not. This "birthright" and opportunity come laden with responsibility—to yourself and to others—to be intentional about your personal legacy. Tiny Jewel Box is full of things you want to own. The 12,500-square-foot luxury jeweler is undergoing a 6,000-square-foot expansion, set to be finished this fall. (The average high-end jewelry store is 3,675 square feet, according to Jewelers of America, a trade organization.) When the dust settles, the store will have 90 feet of prime retail frontage and a coveted corner entrance at Connecticut and M Streets in Washington, D.C. Many family business owners recognize that long-term sustainability of the enterprise depends on the family's ability to innovate. But what can a family company do to encourage and nurture innovative thinking? Joe Schmieder, a principal consultant at the Family Business Consulting Group, offers some suggestions in Innovation in the Family Business. The Business: Turner's Fine Furniture was founded in 1915 by M.W. Turner Sr., who originally sold hardware in Pelham, Ga. He and his son began selling used furniture during the Depression and later transitioned to new furniture sales. Today, there are four Turner's Fine Furniture locations and six Turner's Budget Furniture locations in South Georgia.